Best-Running-Tips.com offers unique, well-priced, custom-designed and targeted advertising options that reach your customer during the pivotal research stage. This passionate, running-loving site is well visited by beginning and more experienced runners and people interested in their health and fitness levels. It offers service providers, through the format of exclusive sponsorships, the opportunity to increase your business in your sector of the running, health and fitness niche. There are many offline ways to advertise your running store, coaching service, heart rate monitor supplies, dietician, injury-related and all other running and health-related services. The common route is still to place ads in numerous glossy magazines and brochures. This can be a costly and ineffective exercise. When it comes to reaching runners who are thinking of using services like yours, newspapers and magazines are transient, semi-targeted, limited geographically and in circulation. A PR piece may give a short-term boost. After that? Here today, wrapping fish tomorrow. The largest disadvantage, though, of offline "pre-visit" print media, is that it is intrusive. It reaches your audience at a time when most are likely not considering to buy your services. On the Web, your running and health advertising reaches a highly targeted audience specifically when they are searching for running and health-related information about your sector. The right website has the power to reach those highly-targeted customers, and more of them, 24x7x52. It takes persistent, repetitive, and positive exposure by a trusted authority who shares the passion to deliver the results that your advertising dollars have long sought. Nearly Everyone Researches Their Running Gear, Apparel, Books Online! This site gets found on a monthly basis by 6,000+ different search terms. This site "patiently" waits, ready to reach your future customer when s/he does this Web research, whether it is at 2am in the morning or 4pm in the afternoon, whether it's in December or in August. Best-Running-Tips.com connects with readers before they buy their running shoes, heart rate monitor, apparel, gear, books or injury-related products. They find Best-Running-Tips.com at the start of their research, hunting for tips and recommendations. According to several traffic-measuring services, Best-Running-Tips.com is doing very well for an individually owned niche website. You can verify the traffic of any website at sites like Quantcast.com and Alexa.com. For example, here is the traffic ranking of Best-Running-Tips.com, according to Alexa.com. There are over 100 million websites in the world. Mine is normally ranked around the 200k-300k mark. And here is a chart showing daily visits to Best-Running-Tips.com, according to Quantcast.com. 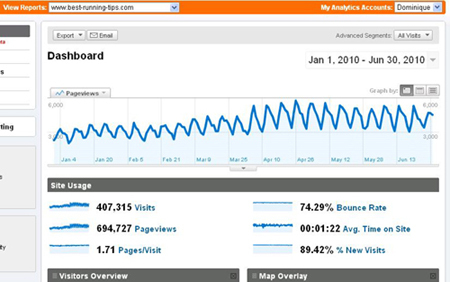 Here is some Google Analytics information showing increasing popularity of the site. Best-Running-Tips.com was started in 2005. Since then, it has been a labor of love, a product of passion. I simply love running and I love helping others out. My favorite part is answering questions from runners, providing direct answers to the issues they are dealing with. The site provides in-depth running training advice and also lots of advice on good products to buy. Over the years, Best-Running-Tips.com has grown in popularity and size. Most people first discover Best-Running-Tips.com through 1 of the 700+ pages (and growing). Many "hang around" and come back time and time again as their running career progresses. I have helped people from zero minutes of running to finishing half marathons via the running programs on my site. Visitors enjoy the unique flavor of the site, often cherry-picking and printing out what to do when running. Many are long-time followers of the site, even contributing their own fascinating stories or asking questions. They are intelligent, engaged and intend to run for years and years to come. They are the audience you want to reach. This is not a "business" website or directory, so there are few sponsorship opportunities and I do not seek for exorbitant fees. Best-Running-Tips.com seeks a small number of quality partners, who want to create win-win-win (you-visitor-Best-Running-Tips.Com) promotional partnerships. "Never lose what Best-Running-Tips.com is all about... One man's love for running and teaching people about running." Best-Running-Tips.com is accepting a limited number of sponsorships . You must truly have an excellent product or service. Best-Running-Tips.com will not work with a company that would result in visitors having a sub-par experience. * Site wide placement of ad in right-hand column, left-hand column or at bottom of the page. * Over 115k page-views per month and growing. * Link to Review Page of your service/product via Image (max 120x200 pixels) and Text Link. * Noref, nofollow links on Review Page (paid links need to have these tags in order to comply with Google and other main search engine rules). * Review pages have max of 4 pictures to be supplied by you (limitation to picture sizes is 100kb and width of 500px). * Review Pages to be written by us (+/- 550 words), based on your directions. Minimal work for you. Your approval will be sought before placement of Review Page. * Review Page will contain no extra advertising (e.g. Google adsense, Infolinks, other advertisers) in content. * Review Page will be provided with extra exposure via inclusion in blog and Twitter. * Package 1: US$75 / month. No minimum duration of placement. Recurring biling can be terminated by you at any moment or by us upon your request. Both sides have the right to terminate the relationship at any point in time. * Link to your website via Image (max 120x200 pixels) and Text Link. * Noref, nofollow links to Your Website (paid links need to have these tags in order to comply with Google and other main search engine rules). * Package 2: US$50 / month. No minimum duration of placement. Recurring biling can be terminated by you at any moment or by us upon your request. Both sides have the right to terminate the relationship at any point in time. * Placement in most relevant category upon mutual agreement (e.g. if running apparel related then in running apparel-category). No placement on homepage. * Link to Review Page of your service/product via Contextual Text Link on the main page of the category. * Link to Review Page at bottom of the category's pages (e.g. if running apparel related then there will be a link on each of the +/-20 running apparel pages at bottom in between the links to the other running apparel pages). * Package 3: US$50 / month. No minimum duration of placement. Recurring biling can be terminated by you at any moment or by us upon your request. Both sides have the right to terminate the relationship at any point in time. * Page specific placement (excludes homepage). Placement upon mutual agreement. * Page-views for specific page can be shared upon request. We can also provide advice on best placement. * Noref, nofollow link to your website (paid links need to have these tags in order to comply with Google and other main search engine rules). * Banner OR contextual link OR ad within content of the page, placement yours to choose after introductory paragraph. * Banner max size is 500x100px and < 100kb. * Ad in regular font size and max of 75 words, marked at top with "Message from Our Sponsor". * Once your ad / banner / contextual text link is placed the page(s) will receive some extra exposure as it will be included in the site blog and the page(s) will be re-tweeted as well. - Package 4a: US$25 / month for single page. - Package 4b: US$35 / month for two pages. - Package 4c: US$50 / month for four pages. * No minimum duration of placement. Recurring biling can be terminated by you at any moment or by us upon your request. Both sides have the right to terminate the relationship at any point in time. * Placement of your ad in next edition of Best Running Tips Newsletter. * Over 3,200 subscribers and growing by 40-50 per week. * Ad in regular font size and max of 75 words marked at top with "Message from Our Sponsor". * Newsletter is sent to subscribers once and also permanently placed on the Best-Running-Tips.com website. * Link to newsletter page on the site on backissues page and via inclusion in blog and in Twitter. * Package 5: US$50 per ad. * Ad replaces Google Adsense blocks. * Pay per click, mutually agreed rate. US$50,- to be paid in advance, after that you will be invoiced as needed in order to cover expected clicks on a monthly basis. * Once your ad is placed the page(s) will receive some extra exposure as it will be included in the site blog, posted on the Facebook page and the page(s) will be re-tweeted as well. * No minimum duration of placement. Both sides have the right to terminate the relationship at any point in time. Please contact me via the below contact form if you wish to discuss this type of sponsorship or if you have any other questions about sponsorship packages. Please note that once you are locked in to a rate or a package I will NEVER increase its price. I do however review pricing regularly as Best-Running-Tips.com attracts more and more visitors every month.